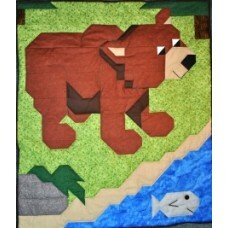 This baby bear brown bear is a more realistic design of a bear fishing, and a cute addition to my forest friends. *3 sizes: Wall 24"x28", Crib 36"x42, and Lap 48"x56". Great lap quilt for the outdoorsmen in your family. *Skill Level: Beginner The pattern lists fabric yardage, then uses tables to show the number of strips to cut and the number of pieces to cut from those strips. The entire top is then sewn using straight 1/4" seams. The shaping is done with quick corner triangles also called the snowball method. There are some instructional videos on youtube. Just search Counted Quilts. Selecting Fabric: Due to the fact that the pattern pieces may be sewn both horizontally and vertically to make the picture we recommend using non-directional fabric.